We here at Motorcycle.com like the Suzuki V-Strom 1000XT. In fact, we named it the value choice of our recent Big-Bore Adventure Touring Shootout (Part 1, Part 2). 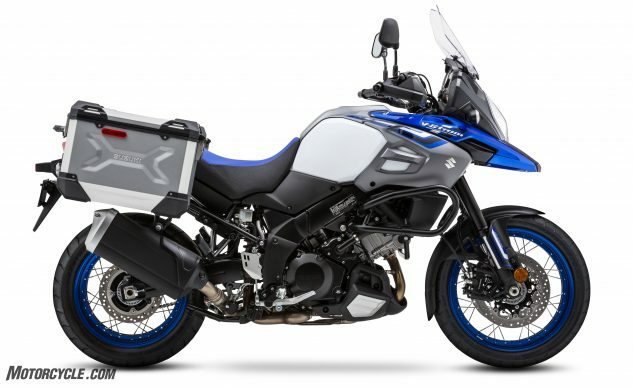 So, imagine our surprise when we saw that some of the same accessories installed on our 1000XT for the tour were now standard fare on the 2019 Suzuki V-Strom 1000XT Adventure. Using Suzuki’s venerable 1037cc 90° V-Twin, the V-Strom has enough power to get any number of jobs done in a workmanlike manner, testing on the MO dyno at 92 hp and 67 lb-ft of torque. With fuel mixture that is almost always spot on, the twin throttle bodies feature niceties like 10-hole injectors and butterflies that automatically open slightly when the rider eases the clutch out to help prevent stalling. Unsung hero kind of stuff. For a value-priced motorcycle, we were impressed that Suzuki thought to include three levels of traction control, linked braking, and five-axis IMU-assisted Cornering-ABS. Aside from some initial abruptness, the radial-mount Tokico calipers offered tremendous stopping power. Both on- and off-road, our testers commented on how well the biggest Strom handles, and one key feature that can’t be overlooked by those who are shorter of inseam, the seat height is only 33.5 inches (if it is the same as 2018), which is on the low side of the current adventure touring offerings. The wire spoked wheels readily accommodate tubeless tires giving a wide choice of street-focused and dirt-focused rubber options. 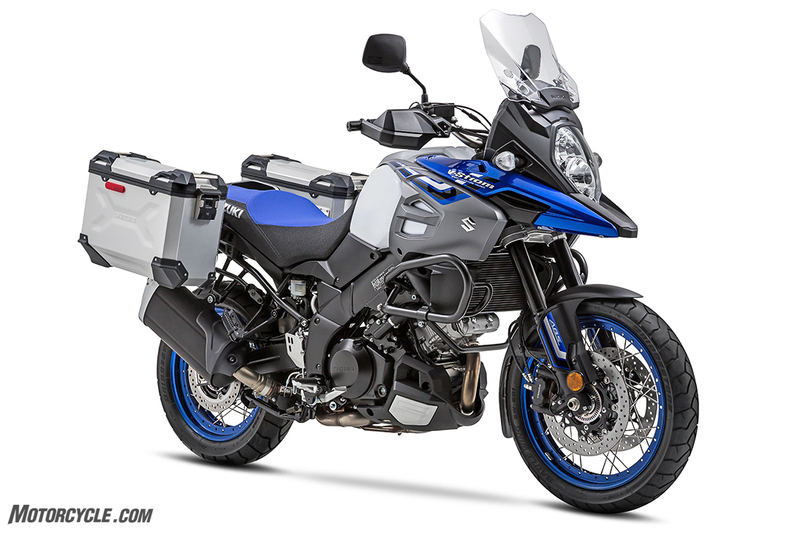 The icing on the cake is the inclusion of the Suzuki aluminum panniers on the V-Strom 1000XT Adventure. Like its smaller sibling, the V-Strom 650XT Touring, the big Strom gets an accessory light bar. Riders who enjoy two wheels far into the cooler seasons will enjoy the standard heated grips. And we’re happy to see a center stand making an appearance on the included items list. All of these will be available for a base price of $14,599.